Think you've got a strong thinker when it comes to weather predictions? You could score a tram ride. Oct. 1 means the start of the Halloween season, yes, but also the annual snow-guessing contest at the Palm Springs Aerial Tramway. REALLY AND TRULY, and in full and total honesty, when it comes to the end of September 'round Southern California we practically can't draw what an ice cube looks like, much less put into descriptive detail the nature and coldness and crunchiness of snow. Sure we saw snow once, maybe, years ago, or decades, but the throbbing heat that settles over SoCal during the ninth month on the calendar has a way of making us, well, a little out-of-the-know regarding snow. Yes, it is factual that, within a couple of months, or even weeks, flakes could be frosting up our ski slopes in the central and southern parts of the state, but when you come to the end of September and you're still wearing your swimsuit around the house, snow is nearly a myth in your mind. Except when it comes to what happens, each and every year, around the first day of October. It's tradition, and it involves some crafty guessing (the best kind of guessing), and there's a free thing at the end, if your crafty guessing is the very best. We speak of the Palm Springs Aerial Tramway's Snow Guessing Contest, which involves a little weather acumen, a sense of Mt. 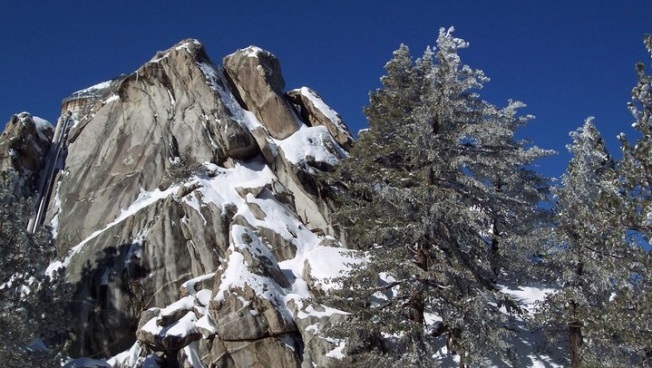 San Jacinto and the wilderness surrounding the tram, and a lot of luck. It opens on Oct. 1, 2015. FOUR TRAM ADMISSIONS... are up for mitten-handed grabs for the winner, so all you need to do is this: Be correct in determining the exact day the first inch of snow will fall at the tram's Mountain Station. The elevation is a pinch over 8,500 feet, so, yes, dear doubters, there is snow at something called the Palm Springs Aerial Tramway. It just happens very, very high up. So, when will the first inch of snow fall at that elevation? As in, the date? The good news is ten entries shall be selected -- well, ten entries that got the right date for the snowfall (and if the tram gets over ten entries, the postmarks will determine the victors). So, when will it happen? Nov. 15? Nov. 29? Dec. 2? You remember snow, surely? Then surely you'll want to throw your own estimate onto the icy pile. It could get you and three friends a trip up the big mountain on one of the desert's landmark attractions. So, c'mon, snow; we hear we're in for a wetter winter, so let's see if you'll deliver on that promise.